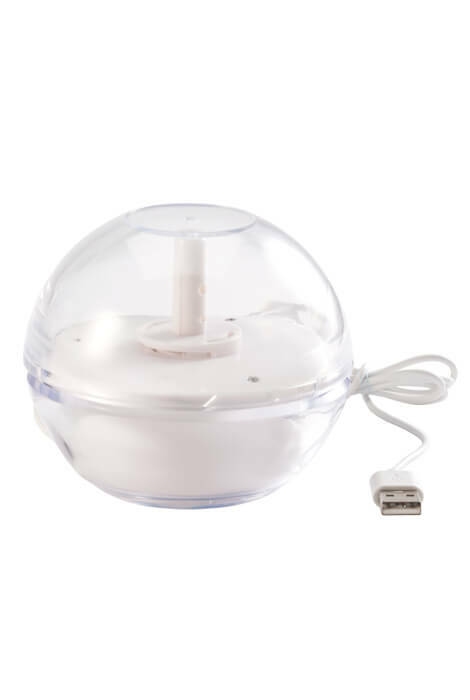 Sleep better with this USB humidifier & diffuser with LED night light that transforms stale, dry air into a more comfortable, relaxing environment. Simply connect to your own computer or wall adapter using the included USB cable and add distilled water. The whisper-quiet air humidifier adds moisture to the air to help alleviate dry skin and sinuses, cracked lips, headaches and more. Add your favorite essential oils for aromatherapy benefits and a spa-like atmosphere; includes replacement diffuser sponge. Calming LED bulb provides just the right amount of night time light that won't disturb sleep, and can be turned on and off with ease. Auto feature powers off when empty; holds 120 ml. Compact, 2 watt essential oil diffuser covers 100–200 sq. ft. Approx. 4 1/8" dia. Pair with our USB wall adapter for plug-in convenience (sold separately). 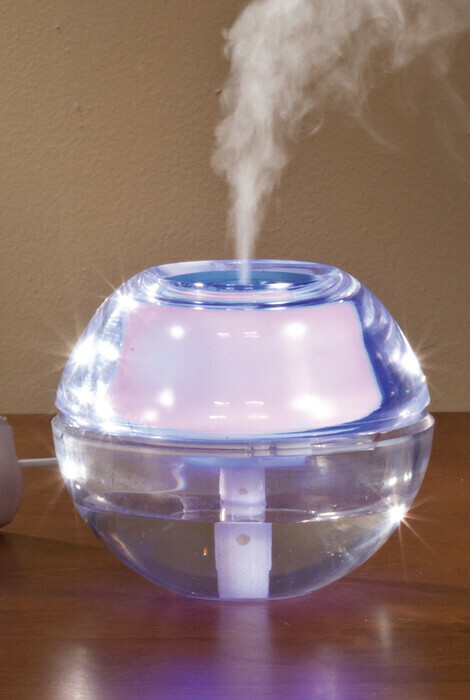 3-in-1 humidifier, diffuser and night light. Adds moisture to the air to help alleviate dry skin and sinuses, cracked lips, headaches and more. Includes replacement diffuser sponge for essential oils. Calming LED provides just the right amount of night time light that won't disturb sleep. Auto feature powers off when empty. Compact, 2 watt device covers 100–200 sq. ft. Pair with our USB wall adapter for plug-in convenience (sold separately). Night light a little too bright. Mister keeps stopping.